It is never too late to change and improve one’s function. That tastes nice,” Austin said as he ate half of my banana. I couldn’t help but smile at him, remembering just a few short years ago, when at his initial evaluation I was told that for the past 20 years he had only eaten chips, fries, and apples. Yes, you read that correctly—only those three things. He was a self-restricted eater. Austin had many issues, being diagnosed with autism and a “Learning Disorder.” Over the past several years, however, he has been showing us what he is capable of. To give you a little background, Austin is a client that I see in St. George, Utah, a small town that borders Utah and Arizona. Many people retire there, as it has very mild winters. I am fortunate to work with a group of families there who all have adult children with special needs. These adults range in age and in function. Most all of them attend the NACD Foundation’s Children of Hope Academy (COHA), a non-profit program across the street from Dixie State University. All the students have individualized NACD programs that are carried out at the school by their parents, hired tutors, and/or volunteers. COHA is led by one of our long-time NACD parents whose daughter has been on NACD program for 40 years! Austin started NACD in 2014. He was 23, out of the post-high program from their local public schools, and really not doing anything. Mom knew that he was capable of more and needed to be stimulated. When I first met him three years ago, Austin wasn’t doing a whole lot. He watched hours and hours of TV (SpongeBob exclusively and a few animated movies over and over again). He had very few interests outside of his TV and computer—although he would go with his family to football games or to church. Austin wouldn’t initiate helping around the house and would only clean his room on request. When I first met him, he would only answer my questions with a head nod for yes or no, and if he did say something, it was heavily animated and a direct quote or movie line from SpongeBob. Academically his math ability was around a 4th grade level, and his reading comprehension around a 3rd grade. His sensory channels functioned fairly well—had a few mild sensitivities to touch and sound, but nothing too extraordinary. Austin was a classic example of what we see with many children/adults in which their auditory processing ability is delayed—he was a superior visualizer, but very weak conceptually. His auditory/language development was what I would have liked to see when he was 3-4 years old. His visualization abilities took over and became significantly stronger. As a result, he would engage in heavy video speak, and he was very inflexible with schedules and routines, to the point that he considered as threatening any food outside of what he knew he could eat. Language was from movies, not truly spontaneous or conversational. We had an imbalance that we needed to change. Austin’s mom went to work, along with the help of family and hired help at home and at the COHA. Over the past three years, Austin has been working hard on his NACD program. At his last evaluation, I was so overjoyed that I had to fight back tears as I worked with this young man. First of all, he is ten times happier. He is so helpful around the house—he loves and asks to do chores—can do all the laundry, dishes, dust, Swiffer, and changes the sheets. Austin has become a huge contributor to his family, and as a result, his self-esteem and confidence has increased exponentially. He loves basketball and football. He did not hesitate to tell me about the Denver Broncos and BYU and Utah Utes and who is going to have a good season. Austin’s video speak has gone WAY down, and you only hear it if it is an appropriate statement for the context. You can tell him to stop and he will. 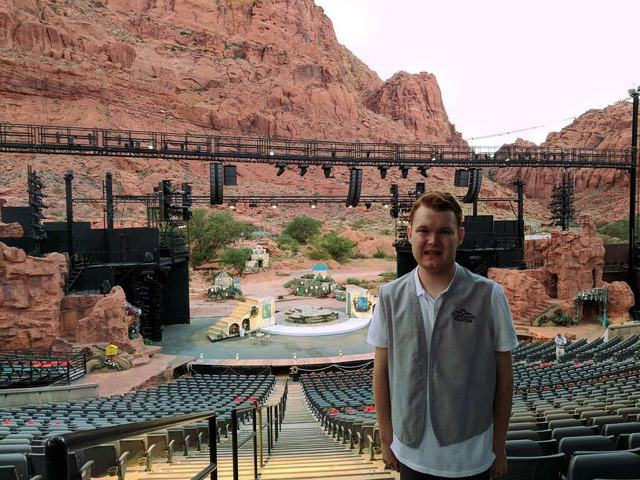 He volunteered at Tuacahn this summer as a page that handed out programs to patrons and showed them to their seats. (Tuacahn is an outdoor amphitheater that provides shows and concerts throughout the summer and fall.) He learned how to talk to the patrons, greet them, and take them where they needed to go—all from a boy who three years ago wouldn’t say a peep unless under pressure to answer. Austin’s auditory processing has increased significantly over the past three years. His auditory short term and working memory is average for any adult. He is still stronger visually but the imbalance is lessening. He loves doing academic work. His math ability has increased significantly, and his reading comprehension has improved over 5 years’ worth in the past three! He is no longer sound sensitive, and what is so great is he will try pretty much any food you give him. He understands now that it is ok to eat other food, that nothing will hurt him. He understands that trying new foods is a part of enjoying life. He may not finish it all, but from a boy who for 20 years lived off potato and apple—I’ll take it! Austin is more spontaneous, more verbal, more willing to try new and different things. He isn’t as rigid in his routines, and he is overall just a happier human. I am thrilled with how far he has come and I am excited to see what the future has in store for him. We are working toward employment and independence and I am confident he will get there. Remember, it is never too late to improve your brain’s ability to function. All it takes is the right input, delivered with sufficient frequency, intensity, and duration. I am so proud of Austin and his family. Thank you for giving me the opportunity to be a part of his life!